Put simply I adored this book. It is a perfect romantic YA read and I cannot recommend it enough. For me this book did several things perfectly. Firstly the storyline was effortless to follow meaning I couldn't put it down. I have always been a fan of Keris's books so it isn't a huge surprise that I thoroughly enjoyed it because I love her writing style and characterisation. If you've not read any of her books I'd compare this book in particular to a Sarra Manning title but aimed at a slightly younger audience. I adored how brilliantly diverse this book was in its characters but also how it wasn't done in a gimmicky way. I loved that not all the characters were white straight girls and actually therefore so much more representative of the diversity of modern Britain. 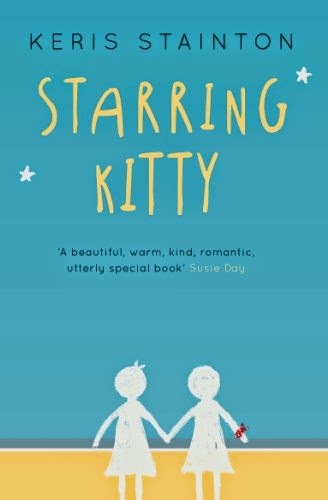 This story in particular is about a teenage girl called Kitty who realises she is gay and explores her realising this and the blossoming romance with a girl she has just met. I loved just how normal it was. The story could have easily been the story between a girl and a boy in the feelings that were developed between them but I loved how actually the romance just happened to be between two girls. I adored Kitty and Dylan as a couple and seeing their relationship develop. Special shoutout needs to also go to Kitty's family who were all just lovely from her liberal minded grandmother and to her gay older brother. I also loved loved loved that Kitty had the extra family pressures of her mother being ill. By that I mean that I loved how she went home and cooked dinner for her family because she was needed to step up to it because of the pressures the family unit were facing and it was just done in a matter of fact way. So many times in YA fictions parent's just don't exist or are there to purely facilitate their children's existence by means of providing food, housing, money. Again I loved the realistic normalcy of it all and the potential role model Kitty is to those kids out there who aren't waited on hand and foot by stay at home parents whose sole existence is to serve them.